Truthfully, this one is a renter. Halloween is the big talk of the week. 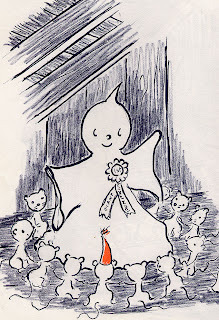 Planning parties... buying patterns for costumes... so, little books about ghosts and goblins are the order of the day. As such, we hit the holiday section at the library and came up with Georgie. Wherever there are children, there is Halloween, with pumpkins and funny faces, with tricks and with treats. But in the little village where Mr. and Mrs. Whitaker lived there was always something extra besides, and that was Georgie, the little ghost that lived in the Whittaker attic. I know it is naive to trust there were truly simpler times in the world, but to think there is a gentle, shy little ghost out there sends some warmth to my heart. A decade or so back when they made that horrific live-action/animated version of Casper the Friendly Ghost, I though it was interesting that at the end of the movie Casper had the realization that Casper was a ghost... meaning that he was a child that was dead. At the time, I thought that was pretty heavy and cosmic theme to put in a so-called kid's movie. Not that I thought there was anything wrong with it. Quite the opposite, but that movie came into my mind tonight as I was reading the book about sweet little Georgie to my son. I suppose one day he will ask what a ghost is, and I'll have a hard time pretending it's nothing more than a cute, little happy... thing, too shy to trick-or-treat on Halloween.